Produced by Walt Disney Feature Animation, The Rescuers Down Under is a Disney classic. The film is a sequel of another animated film, The Rescuers, based off of novels written by Margery Sharp. Based in the outbacks of Australia, a child named Cody rescues a rare eagle named Marahute. He befriends the gold eagle who leads him to her nest. After which, Cody is kidnapped by a mean poacher, (who is wanted) Percival C. McLeash, via an animal trap. Percival spots a feather on Cody's backpack which fills him with excitement. Percival previously captured the eagle's mate, and knows they can make you rich. Percival wants to make the Rangers believe Cody was eaten, so he throws his backpack to the crocodiles. A mouse Cody rescues from a trap goes to get help from the Rescue Aid Society. The message successfully reaches the Rescue Aid Society in New York. Bernard and Bianca are field agents of the society and accept the mission. They convince a friend's brother to fly them to Australia where they meet a kangaroo mouse named Jake. Jake falls in love with Bianca which annoys Bernard. Jake is their "tour guide." They eventually spot Cody with the poacher and jump into his car, because they know Cody is in danger. Ultimately, Bianca and Bernard rescue Cody and bring him home. Bernard proposes to Bianca and she accepts. Jake finds a new found respect for Bernard. The Rescuers Down Under includes three characters from the first movie; Bernard, Bianca, and Chairmouse. All of which are the same actors portraying the speaking roles. Bob Newhart does the voice for Bernard, Eva Gabor is Bianca, and Adam Ryen is Cody. Released on November 16, 1990 and directed by Hendel Rutoy and Mike Gabriel. 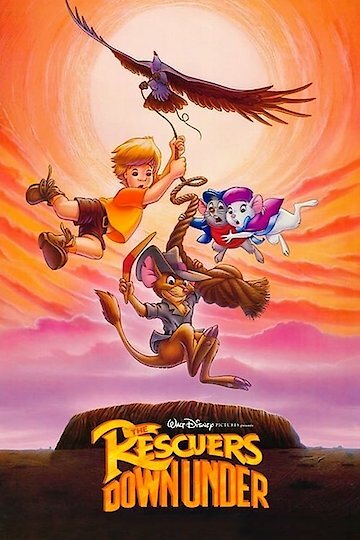 The Rescuers Down Under is currently available to watch and stream, buy on demand at Amazon, Vudu, Google Play, iTunes, YouTube VOD online.